EUC women's ALEGRIA patent leather print MARY JANE shoes - size 40 - CUTE!!! 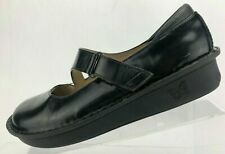 Womens Leather Alegria Mary Jane Shoes Sz 9 Or 39 Black Strap . Condition is Pre-owned. Shipped with USPS Priority Mail. Good condition. Minimal scuffs on the heel only. Uppers are in great condition. Medium width. 2 inch heel. Alegria Women's Black Mary Jane Button Strap PAL-601 Size 41EU, 10.5 US. Shoes have orthopedic insoles that are original to the shoes. Insoles are nice and shown in pics. Straps connect with velco. Condition is Pre-owned. Shipped with USPS Priority Mail. Alegria Pal-334 Black Paloma Mary Janes Clogs Black/Silver Women's Shoes SZ 36/5.5-6. Condition is Pre-owned. Shipped with USPS Priority Mail. Fair condition, still with lots of life left in them. Alegria JEM-711 Womens Black Shoes Mary Jane Euro 40. Condition is Pre-owned. Shipped with USPS Priority Mail. Alegria Onyx Crackle Jill Sandals Womens 42 Mary Jane Metallic JIL752 US 10.5-11. Condition is Pre-owned. Shipped with USPS Priority Mail. Leather covered insole allows for your feet to naturally breathe, leaving them feeling fresh and dry. New shoes, never used. leather lining has oily spots.But they do not affect the quality of the shoes. Part of the Alegria Professional Collection with its stain resistant upper and slip resistant outsole. Have your own orthotic?. Simply replace our comfy footbed with yours. But, you might find the Alegria insole already does the trick. Alegria paloma delicut black leather shoe. Size 9 or 39 EUR. Condition is New with box. They even have a small heel for those extra short people in the world. Condition: Gently preowned, with normal signs of usage. This is a pair of Allegra nursing or work shoes. Anti-slip sole. Size 38 Euro. 8 us. Great shoes for anyone who is on their feet. Comfortable. Safety. Mary Jane's. Black. From a no smoking no pet home. Alegria by PG Lite comfort Mary Janes. --Hook & loop -adjustable Mary Jane strap over top of foot with overlying decorative silver-colored botton. --Black leather upper with matching stitching. Sueded fabric collar. Good pre-owned condition. There is a band aid mark in the sole of one. Shoes are in pre-owned condition and show signs of light wear. Heels and toes of both shoes show light dirt. Length (heel to toe)-11.25". Bottom soles are dirty and show signs of normal wear. Insoles and inner lining are dirty from use. Length (heel to toe)-9". Insoles-9". Width-3.5". From Alegria. Shiny Patent black leather uppers. Style: Jill. Platform Height approx. Algeria Fel Size 9. Mary Jane style shoes in excellent condition. They are a flat black color. Alegria Black Feliz Size 39. Condition is Pre-owned. Shipped with USPS Priority Mail.